Antiseptic leaves of Japanese Menthol plant, Mentha arvensis v. piper, are chewed to relieve a sore throat. When leaves are rubbed between fingers the beautiful strong menthol volatile oil helps to clear head and chest. Or, infuse leaves in boiling water, place a towel over head and inhale vapour. Used for relief from colds, bronchial coughs, sinus, headaches and to soothe mucous membranes and nervous stress. 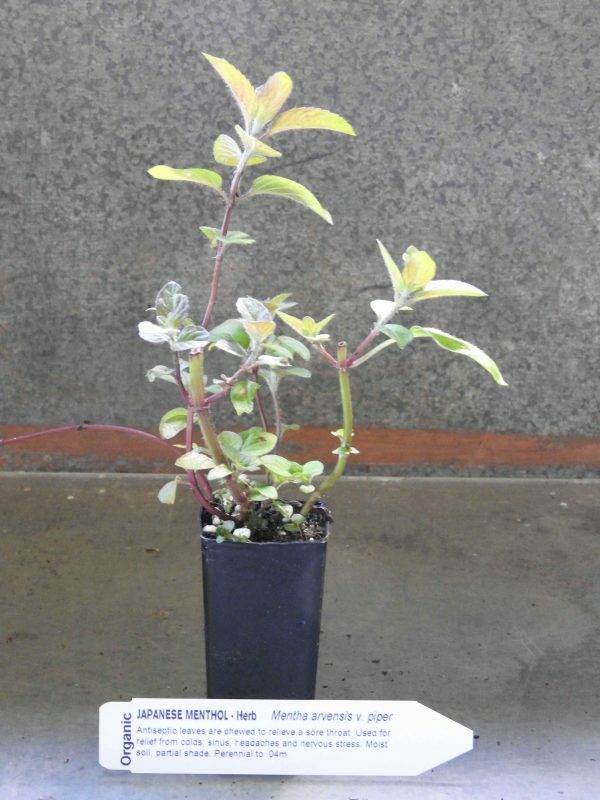 Japanese Menthol plant prefers rich, moist soils, partially shaded, protected position. Frost resistant but drought tender. A perennial that may go deciduous, growing to 0.4m. Be the first to review “Japanese Menthol, plant” Click here to cancel reply.